Nasa Koski cut her teeth in filmmaking through her climbing & mountaineering adventures in the Pacific Northwest. Carrying a camera into the wilderness ignited her passion for storytelling through photos and film. Her short films have toured worldwide and won awards at Banff Mountain Film Festival, 5Point Film Festival, and more. When not running the Adventure Film School, Nasa focuses on short adventure films & commercial work. Her clients include National Geographic, Subaru, Patagonia, Outdoor Research, and Black Diamond. 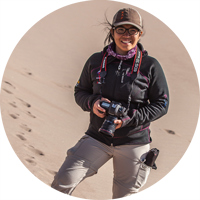 After completing three different courses at the Adventure Film School, Nasa left her 17 year career in engineering to pursue filmmaking. With no previous background in film or creative arts, she made her way into a new industry and career. She now is the Director of Adventure Film School. She is a strong believer in mentorship, hard work, and constant learning. She’ll push you to not only think creatively, but how to strategically use your strengths to achieve your goals.